this week, we have some beautiful sacred music from thailand's northeast; achan duangchan khemachitto performing thet lae! despite buddhist monks being prohibited from performing music, there does exist a tradition of very melodic & expressive vocalizations used for reciting sacred texts, and even sermons composed in klon (the same poetic form used by molam) known as thet lae. 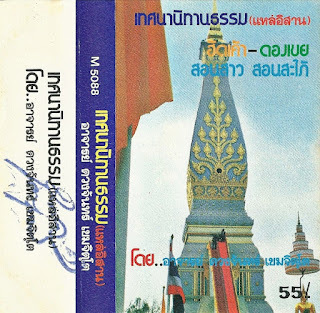 lae can be heard during all sorts of festivals in isaan, and was a significant influence on early luk thung music.. there's even a history of bandleaders courting talented young preachers to become recording stars (including mr. dao bandon, for instance). this tape, however, features the original formula; a solitary voice, unaccompanied & unpolished. 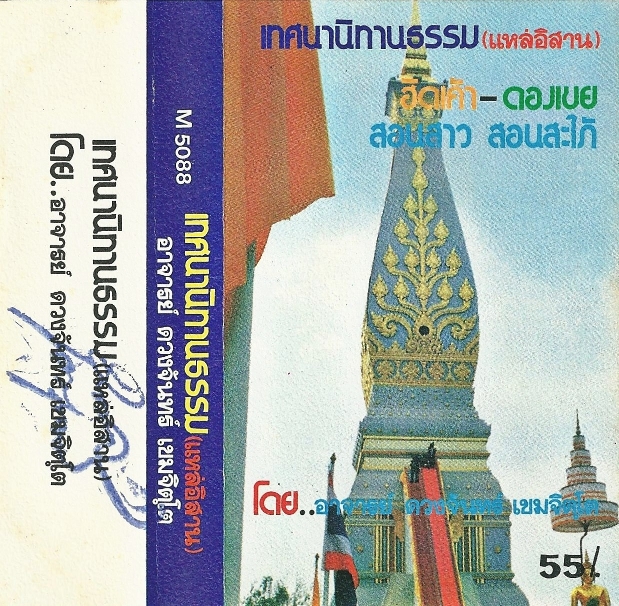 i haven't been able to find out much about our monk, a. duangchan khemachitto, but i would assume he is affiliated with wat phrathat phanom woramahawihan in nakhon phanom, the chedi of which graces the cover of the j-card. enjoy!! very beautiful indeed, thank you very much! so glad you guys like this stuff! got on a very beautiful frame of mind, by listening!